We love personalized items, especially to give as gifts. My children love books and toys that have their name on them or as a part of the story. It makes them feel so special! We recently received an, "I See Me" book, which can be found at: http://www.iseeme.com/. The book comes with the child's name as a part of the flower on the front. You give a list of people that love your child to "I See Me." We chose 6 different names, but if you required more, you could combine names (such as mommy & daddy-- we did mom, and then another for dad). 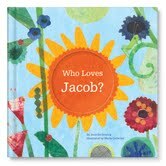 The book moves the child along a story of who loves them, mentioning the child's name and on each page, the person that loves them. The story is a rhyming book, and my daughter loved it. We included specific names of people to make it even more special. So rather than "sister" we gave her specific name, Aurora. This added to the personalization, because all of the children were included in the book. This video illustrates the different book options, and how each book will look. Use the coupon code: wholovesme to save 15% off of your purchase. To receive your book or gift set by Valentine's Day, you need to order by January 31st! MamaBreak received an I See Me book to review here on the website. We did ont receive any other sort of compensation. As always, our experiences and opinions are our own.